Whatever your interest, Quezon City promises to have something for you, and start-up businesses can be assured that there will always be more options for them, thanks to the various focuses of the new tourism campaign. As urbanized as the city is, there are many pockets of greenery perfect for relaxing walks and breathing in fresh air. Brisk walk or jog around the University of the Philippines-Diliman oval, explore the Quezon Memorial Circle, or be one with nature at the Ninoy Aquino Parks and Wildlife Center, or at the La Mesa Eco Park. At any given Sunday, all four destinations are teeming with food stalls and vendors offering snacks and refreshments, and the occasional toys and trinkets. In UP oval, in particular, hit food items include the simplest treats such as bananas (fresh or banana-Q), boiled eggs and taho – all vitamin and protein-packed quick eats that runners buy immediately after completing their laps. Cold Gatorade and energy drinks also sell good. There are so many things to experience in the city, with every area of interest covered. Work out a sweat at the Amoranto Sports Complex, the Laser Maxx at Eton Centris, or the free morning exercise and night ballroom classes at the Quezon Memorial Circle. For those looking for an art fix, there’s the Vargas Museum in UP. Cubao X is one of the most popular spots for those looking for entertainment from local indie artists. It’s also a collector’s haven – sellers of hard-to-find literary books, comics, records, memorabilia and art pieces have shops set up here. There is also PETA, housed along Eymard Drive, for those looking to watch local productions, or wishing to participate in their various workshops and programs. Our local artists are entrepreneurs as well, with their craft as their creative products. Supporting the local arts scene by going to exhibits and shows at these destinations will encourage more of our artists to share their works and actually make a living from pursuing their craft. The Quezon City government is hoping to put education, culture and history at the forefront of its tourism efforts. 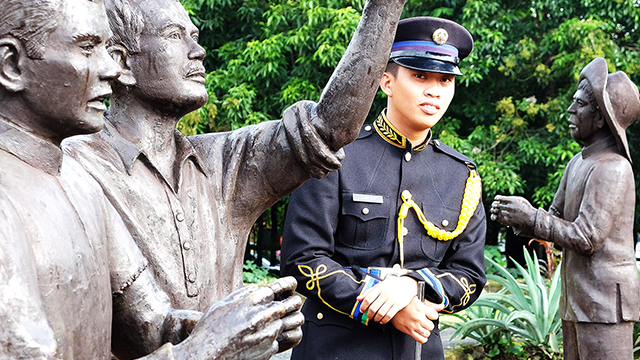 Since the city is the setting to numerous historical events, the city tourism department have opened the possibility of a heritage trail, where monuments like the Cry of Pugad Lawin, Tandang Sora, People Power and the Bantayog Museum could shine like they should. Visitors could learn more in depth about the various peaceful revolutions that have helped shaped the country. If clubbing and popular music entertainment is your thing, the place to be is still the good old Tomas Morato strip. Aside from the numerous dining options available here, the street is dotted with various clubs for dancing, karaoke and live bands. Comedy bars, where standup comedy artists and local actors regularly perform, have also started to flourish. The city is filled with accommodations, from pricier picks to budget-friendly options. The local government is planning to set up smaller lodgings, like AirBnB’s and bed and breakfasts. Entrepreneurs thinking of venturing into the hotel business are encouraged to coordinate with the local government to be informed of the exact kinds of accommodations that would be most feasible to set up. Churches are aplenty in Quezon City, and they are perfect places to quietly reflect and ruminate. From the Parish of the Holy Sacrifice in UP Diliman (a church collaborated on by no less than four National Artists), to the Church of the Gesu in Ateneo de Manila, and the historical San Pedro Bautista Church. 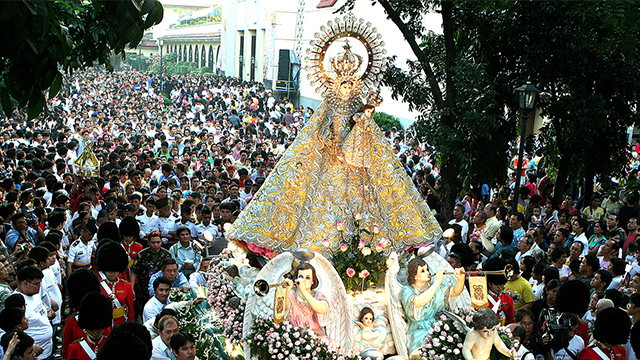 Quezon City is also home to an array of religious festivals. The Feast of Our Lady of La Naval, in particular, is of prominence, as this figure of the Virgin Mary is the patroness of the city itself. A 16th century wood and ivory statue of the Lady is housed in the Sto. Domingo Church and is brought around during a procession during the 2nd Sunday of October. Pilgrims from all over the country flock to Sto. Domingo Church during its feast day, as well as during the Holy Week, when the church becomes part of the Visita Iglesia (seven churches visitation) of most locals and tourists. Expect accommodations to hostels around the area spike up during the Lenten and feast day seasons. Quezon City is teeming with eateries, and locals and tourists alike could be certain to never want for variety. 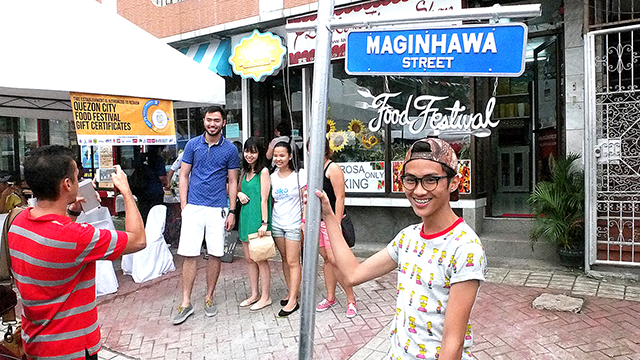 The popular Timog Avenue is still a dining hot spot, and Maginhawa Street in Teacher’s Village is an ever-popular destination. But there are also newer options, like Box Park along Congressional Avenue Extension, and The Yard in Loyola Heights. As well as La Loma, known for its lechon, and Banawe, a street filled with multiple Chinese restaurants. 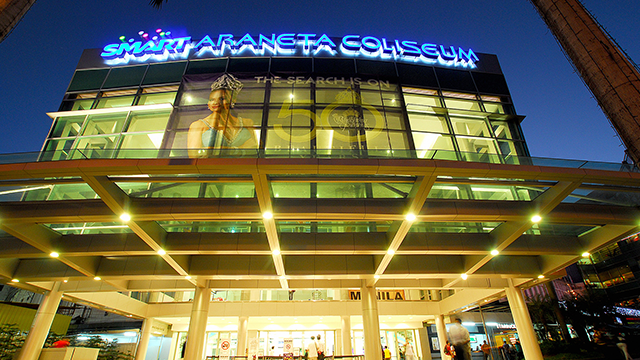 The city is the hub of the biggest and most popular malls: the TriNoMa, SM North EDSA and UP Town Center. They house hundreds of shops, from clothing to appliances, to craft materials, and many more. UP Town Center, in particular, has seen quick development and expansion recently, with the opening of a supermarket last year, called Merkado, and the introduction of four new cinemas last July featuring 4DXTM and Dolby Atmos technologies. But continuing to thrive are the bazaars that appear all around the city, particularly as the holiday season sets in. Eastwood City regularly hosts these bazaars, where sellers can showcase clothes, holiday food giveaways and various collectibles like stationery and toys. A strip in front of Telus Building in Araneta Center is also the usual annual spot for sellers of reasonably-priced Christmas lanterns and décor.